Billy Joel’s “She’s Always A Woman” is yet again a perfect embodiment of how to play piano by chords ear and heart. The chord progression as well as the mix of various cool break-up patterns makes this tune simply an iconic piano tune. Educational on so many levels AND really fun to play. The gorgeous chord progression, holding every “trick in the book,” from simple triads to, diminished, four-note and complicated extension chords. How to use a mix of various break-up patterns to transform that same set of chords to this stellar 8-th beat, flowing piano part. How de-constructing the tune in this way, changes it from an overwhelming amounts of unrelating, hard-to grasp, single notes, to a comprehensible, conceptual piece of music. 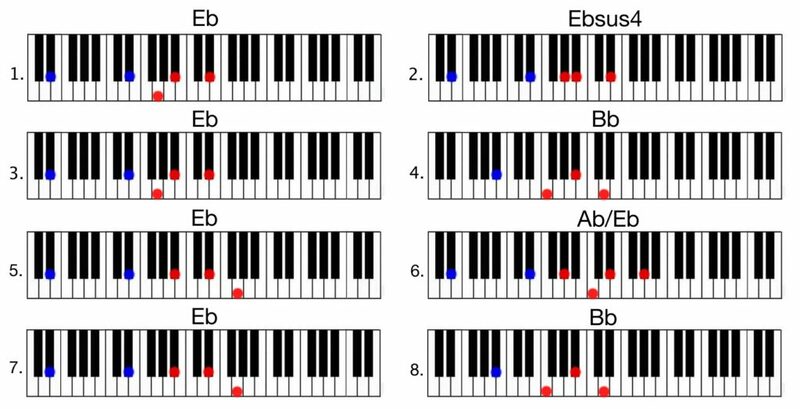 Main chord progression (intro/verse) image below the video.